The ILC’s Executive Council: Rev. Dr. Robert Bugbee; LCP President Antonio Reyes; Rev. Dr. Albert Collver, ILC Executive Secretary; LCC President Timothy Teuscher; SELK Bishop Hans-Jörg Voigt, Chairman of the ILC; ELCE Chairman Jon Ehlers; FELSISA Bishop Dieter Reinstorf; and ELKB President Gijsbertus van Hattem, ILC Secretary. Not present: President Rudi Zimmer by the Evangelical Lutheran Church of Brazil. 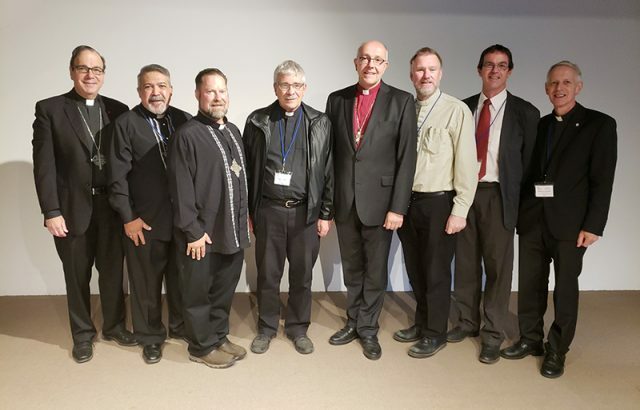 BELGIUM – On September 27, 2018 delegates to the International Lutheran Council’s (ILC) World Conference unanimously reelected Rev. Dr. Hans-Jörg Voigt as ILC Chairman for another triennium. Chairman Voigt is Bishop of Germany’s Independent Evangelical Lutheran Church, a position he has held since 2006. He was first elected Chairman of the ILC in 2012 and was reelected to the position in 2015. He had previously served as Interim Chairman of the ILC beginning in 2010. 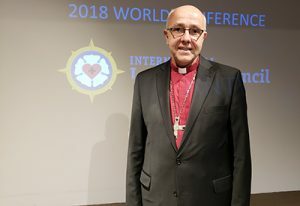 Also on September 27, the ILC reelected President Gijsbertus van Hattem of the Evangelical Lutheran Church in Belgium to serve as Secretary for the Executive Council. The remaining five elected positions on the ILC’s Executive Council are filled by church bodies as opposed to specific individuals. Serving as the representative for Africa is the Free Evangelical Lutheran Synod in South Africa, which is led by Bishop Dieter Reinstorf. The region of Asia will be represented by The Lutheran Church in the Philippines, which is led by President Antonio Reyes. Europe will be represented by the Evangelical Lutheran Church of England, which is led by Chairman Jon Ehlers. The world region of Latin America will be represented by the Evangelical Lutheran Church of Brazil, led by President Rudi Zimmer. Finally, the North American region will be represented by Lutheran Church–Canada, which is led by President Timothy Teuscher. The Executive Committee also has the right to appoint additional voting members to the council as it deems valuable, as per new bylaws adopted in 2017. Rev. Dr. Robert Bugbee (Past-President of Lutheran Church–Canada and former Vice-Chairman of the ILC) has been appointed to serve on the Executive Committee. The Vice-Chairman of the ILC is not elected by the World Conference, and is instead elected by the Executive Council from its World Area Representatives. That election will take place during the Executive Council’s first meeting.